Sure, all mailboxes should be enduring…but why not have one that’s eye-catching as well? The Spira Wallbox has it all, making it hard to miss! In your choice of bold finishes, the Spira Wallbox is constructed of quality stainless steel that complements any contemporary aesthetic. Featuring a lock and a smooth-sealing door, it’s as secure as it is striking. First of all, the product itself was just as described well-made exactly what I wanted very happy with it. A excellent product will quickly decrease in value if the customer service is lousy. This was NOT the case WITH INMOD!!! although the item was not in stock they were very quick to advise and keep me posted when you would be available. They also honored the sale price which was considerably better than any competitor I could find online. Loved their product loved even better their way of doing business simply put superb!!!! Very sleek and modern look! 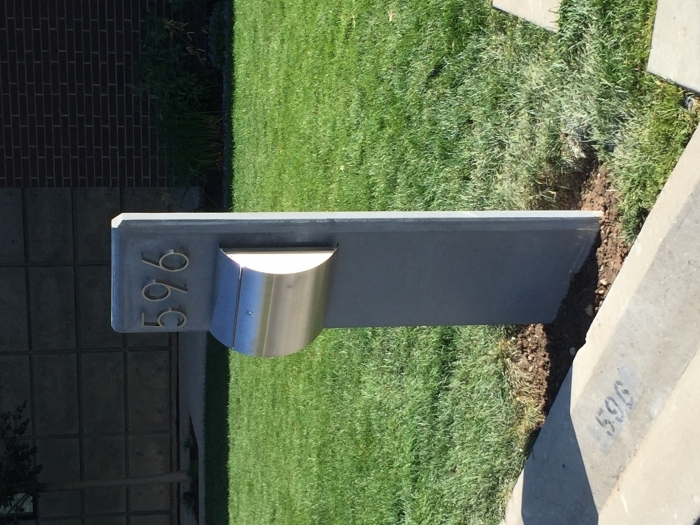 We attached it to a freestanding concrete slab in front of our house with brushed stainless house numbers attached above it. So it could work either way attached to your house or something else. With that being said it is exposed to a lot of winter elements (snow). We just went through our first winter and it held up really good. It also has a lock which is good to have. ConsThe only thing is our mail does get a little wet if it rains or snows just because our mailbox is not covered.